Imagine one day being able printing your own dishes, like in a Star Trek movie. This is the dream of many astronauts. Currently, astronauts have a limited variety of vacuum-sealed or canned foods which they eat repeatedly and quickly gets monotonous; however, 3D food printing may radically change astronauts’ selection of food. In the future astronauts will have the opportunity for a more diversified diet. This pioneering 3D food printing technology enables the creation of meals out of nearly all sorts of materials and increases the potential for personal choices. Jeffrey Lipton, head of the [email protected] project, and his team at Cornell University have developed edible gel-like substances called “hydrocolloids” that can be printed in layers and mixed with an array of different flavours and textures. 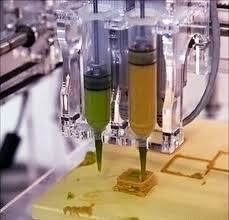 The 3D food printer works by mimicking the taste of different food. This technology can be used to mix in all the nutrients, vitamins, amino acids, and minerals essential for a healthy diet and can even be tailored to individual dietary requirements. The method still has some restrictions and items like chocolate and cheese are easier to produce than more complex items such as vegetables, fruits or meat. The ability to 3D print food would be convenient, especially on long-duration missions. Compared to the conventional method of supplying astronauts with vacuum packaged or canned food, the 3D food device would result in less waste due to packaging and would take up less volume than current methods. It may be quite some time before a 3D food printer is able to create a decent selection of food. Lipton thinks that fabricating a dish of steak and potatoes from scratch is still 15 to 20 years or more in the future. As the technology advances it could be adopted by hospitals or unusual environments in space and on Earth where people have special nutritional needs.